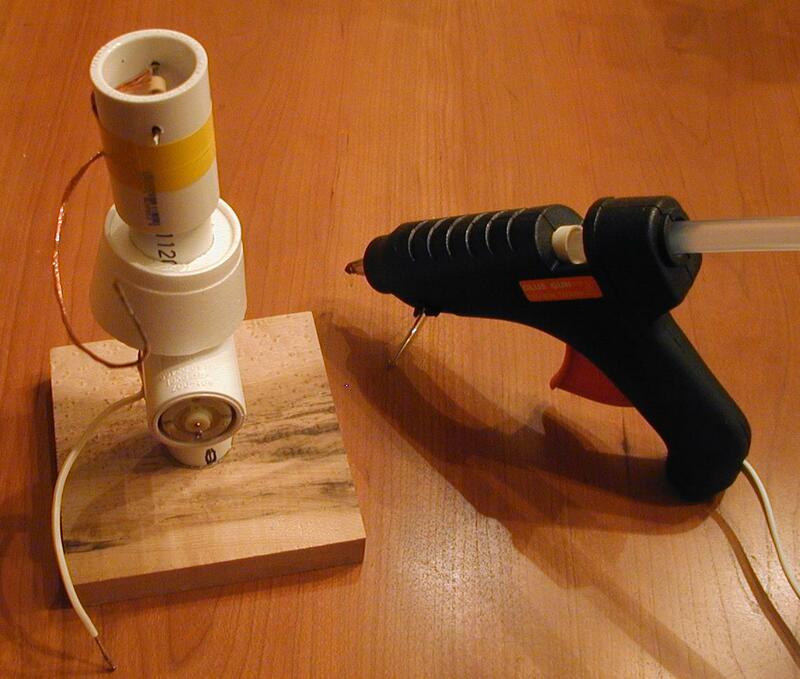 In the previous two projects, we stole high voltage from a television set to power our high voltage motors. 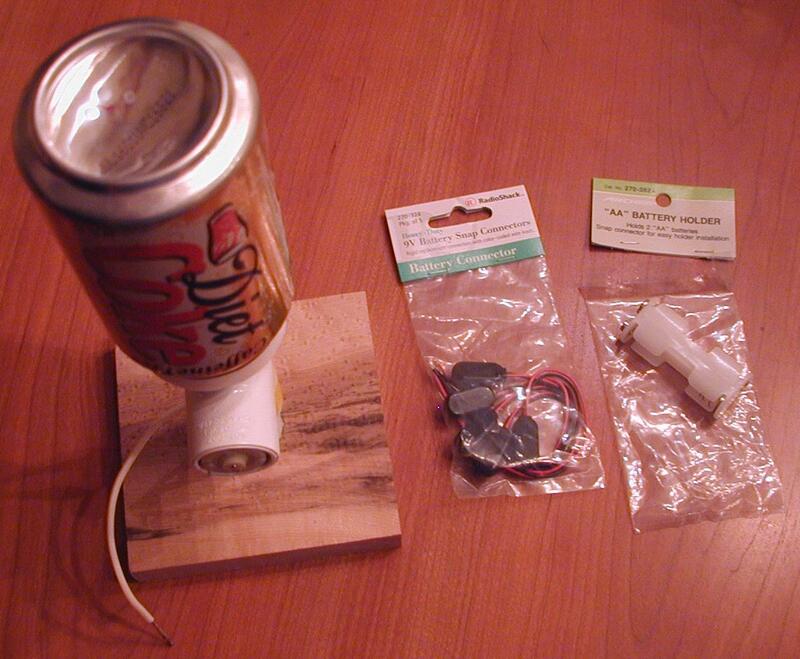 In this project we will build a device that can generate 12,000 volts from an empty soda can and a rubber band. The device is called a Van de Graaff generator. Science museums and research facilities have large versions that generate potentials in the hundreds of thousands of volts. Ours is more modest, but is still capable of drawing 1/2 inch sparks from the soda can to my finger. The spark is harmless, and similar to the jolt you get from a doorknob after scuffing your feet on the carpet. That sounds like a lot of stuff, but take a look at the step-by-step photos below, and you will find that the whole project can easily be put together in an evening, once all the parts have been collected. We'll start at the bottom, and work our way up. 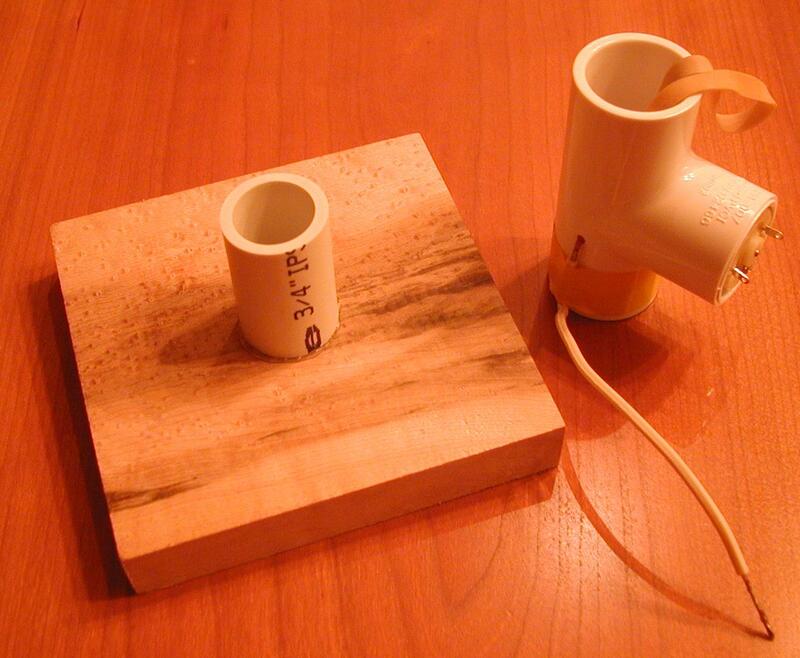 The first thing to do is to cut a 2 to 3 inch long piece of 3/4 inch PVC pipe, and glue that to the wooden base. This piece will hold the generator up, and allow us to remove it to more easily replace the rubber band, or make adjustments. 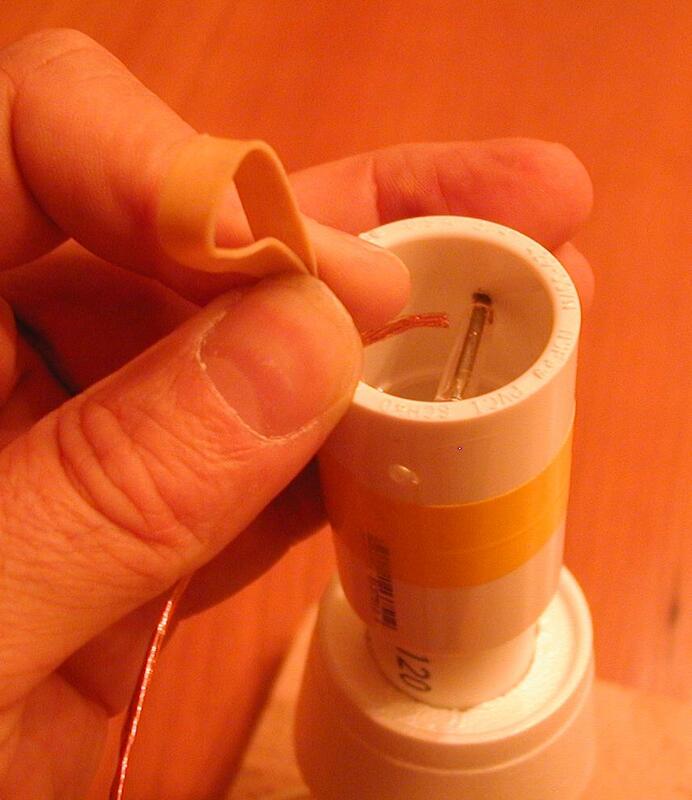 The PVC "T" connector will hold the small motor. The motor fits too loosely by itself, so we wrap paper or tape around it to make a snug fit. 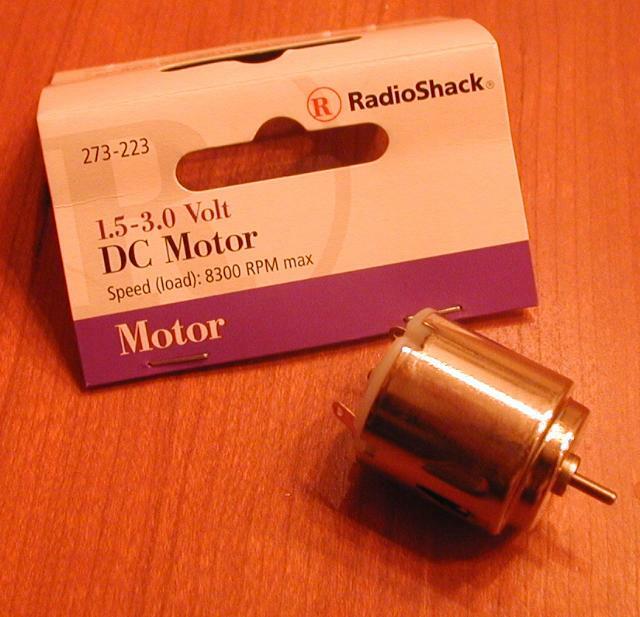 The shaft of the motor can be left bare, but the generator will work a little better if it is made fatter by wrapping tape around it, or (better) putting a plastic rod with a hole in the center onto the shaft to act as a pulley for the rubber band. Next, we drill a small hole in the side of the PVC "T" connector, just under the makeshift pulley on the motor. This hole will be used to hold the lower "brush", which is simply a bit of stranded wire frayed at the end, that isalmost touching the rubber band on the pulley. As the photo shows, the stranded wire is held in place with some electrical tape, or some other tape or glue. The rubber band is now placed on the pulley, and allowed to hang out the top of the "T" connector. 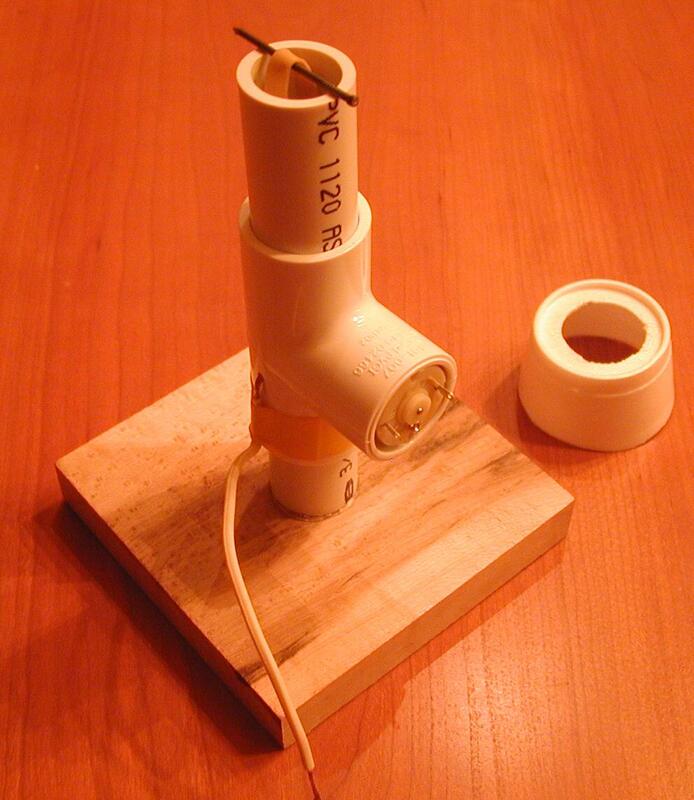 Now drill three holes near the top of the PVC union coupling. Two of these holes need to be diametrically opposite one another, since they will hold the small nail which will act as an axle for the rubber band. The third hole is between the other two, and it will hold the top "brush", which, like the bottom brush, will almost touch the rubber band. 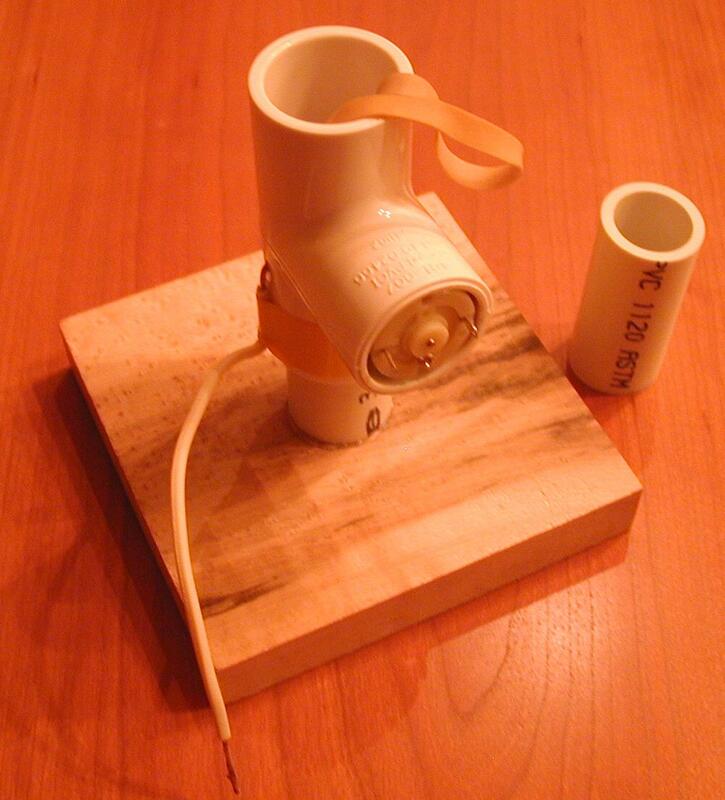 The top brush is taped to the PVC union coupler, and the coupler is placed on the 3/4 inch pipe, above the styrofoam cup collar. 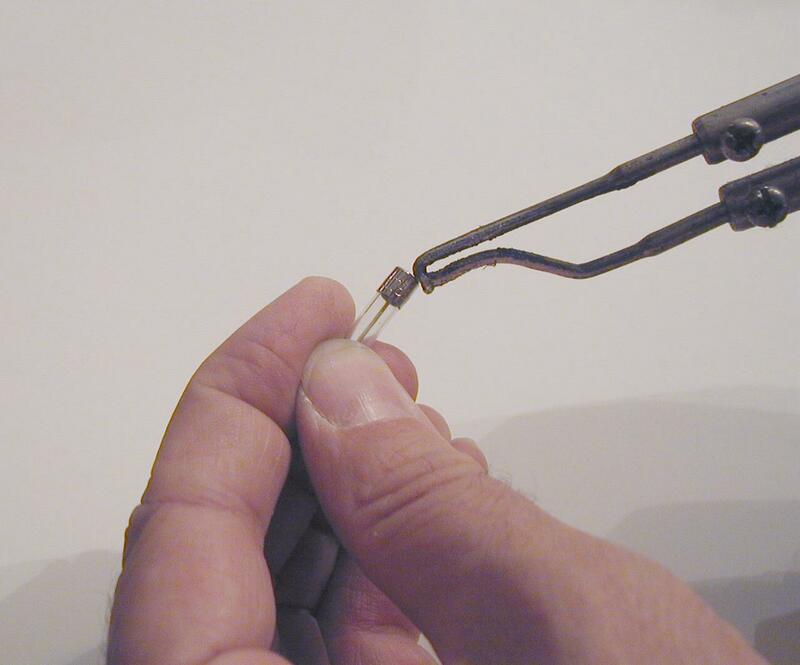 The rubber band is threaded through the coupler, and held in place with the small nail, as before. Bare the top brush (so it has no insulation) and twist it to keep the individual wires from coming apart. You can solder the free end if you like, but it is not necessary. The free end of the top brush will be curled up inside the empty soda can when we are done, and thus electrically connect the soda can to the top brush. We need a small glass tube to act as both a low-friction top pulley, and as a "triboelectric" complement to the rubber band, to generate static electricity by rubbing. Glass is one of the best materials to rub against rubber to create electricity. We get the tube by taking apart a small electrical fuse. 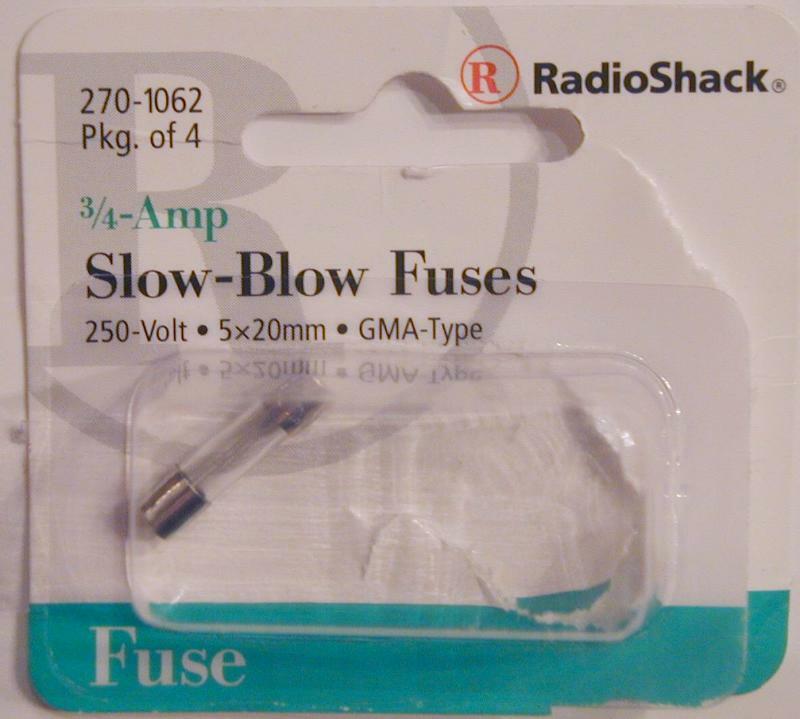 The metal ends of the fuse come off easily if heated with a soldering iron or a match. The solder inside them drips out when they come off, so be careful. The glass, the metal cap, and the molten solder are all quite hot, and will blister the skin if you touch them before they cool. Save the metal caps -- we will use them in a future project! The resulting glass tube has nice straight, even edges, which are "fire polished" for you, so there is no sharp glass, and no uneven edges to catch on the PVC and break the glass. The next step is a little tricky. The small nail is placed through one of the two holes in the PVC union coupler, and the small glass tube is placed on the nail. Then the rubber band is placed on the glass tube, and the nail is then placed in the second hole. The rubber band is on the glass tube, which is free to rotate around the nail. At this point we are ready for the empty soda can. Aluminum pop-top cans are good for high voltage because they have nice rounded edges, which minimizes "corona discharge". With a sharp knife, carefully cut out the top of the soda can. Leave the nice crimped edge, and cut close to the side of the can so as to leave very little in the way of sharp edges. You can smooth the cut edge by "stirring" the can with a metal tool like a screwdriver, pressing outward as you stir, to flatten the sharp edge. Tuck the free end of the top brush wire into the can, and invert the can over the top of the device, until it rests snugly on the Styrofoam collar. 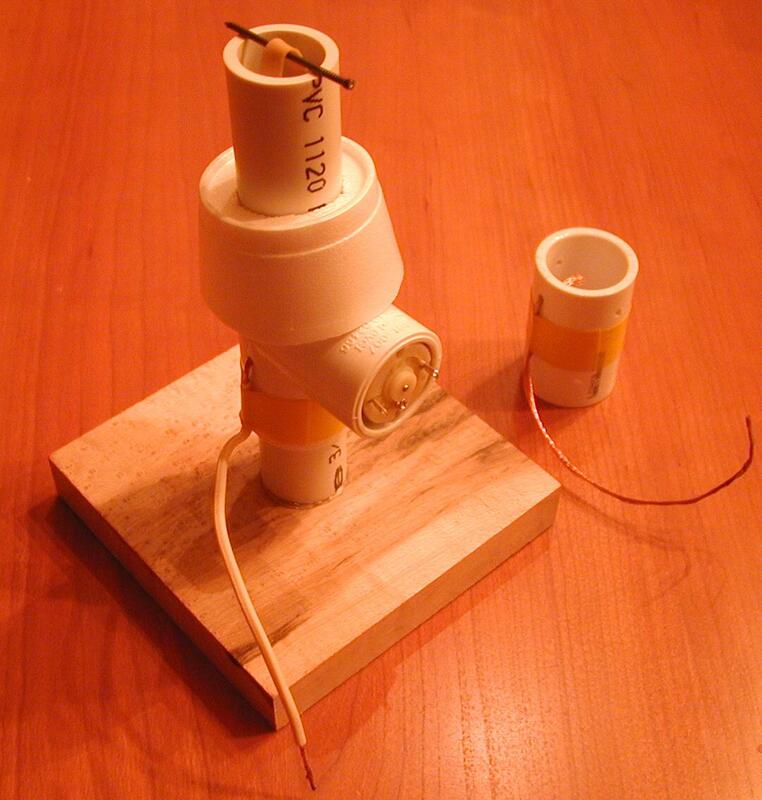 To use our generator to power the Franklin's Bells we built in the previous section of the book, clip the bottom brush wire to one "bell", and attach a wire to the top of the generator, connecting it to the other "bell". The pop-top clapper of the Franklin's Bells should start jumping between the soda cans. It may need a little push to get started. You may have at one time rubbed a balloon on your hair, and then made the balloon stick to the wall. If you have never done this, try it! 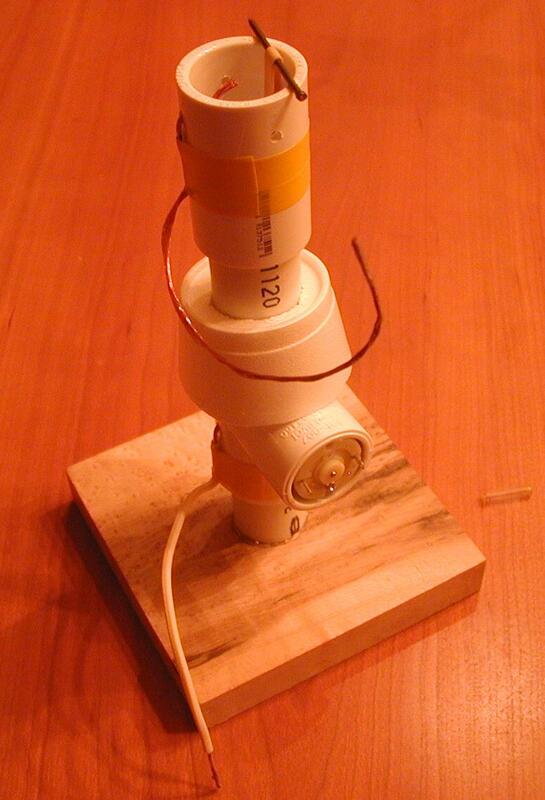 The Van de Graaff generator uses this trick and two others to generate the high voltage needed to make a spark. When the balloon made contact with your hair, the molecules of the rubber touched the molecules of the hair. When they touched, the molecules of the rubber attract electrons from the molecules of the hair. The you take the balloon away from your hair, some of those electrons stay with the balloon, giving it a negative charge. The extra electrons on the balloon repel the electrons in the wall, pushing them back from the surface. The surface of the wall is left with a positive charge, since there are fewer electrons than when it was neutral. The positive wall attracts the negative balloon with enough force to keep it stuck to the wall. If you collected a bunch of different materials and touched them to one another, you could find out which ones were left negatively charged, and which were left positively charged. You could then take these pairs of objects, and put them in order in a list, from the most positive to the most negative. Such a list is called aTriboelectric Series. The prefix Tribo- means "to rub". The triboelectric charging is the first trick. The second trick involves the wire brushes. When a metal object is brought near a charged object, something quite interesting happens. The charged object causes the electrons in the metal to move. If the object is charged negatively, it pushes the electrons away. If it is charged positively, it pulls the electrons towards it. Electrons are all negatively charged. Because like charges repel, and electrons are all the same charge, electrons will always try to get as far away from other electrons as possible. If the metal object has a sharp point on it, the electrons on the point are pushed by all of the other electrons in the rest of the object. So on a point, there are a lot of electrons pushing from the metal, but no electrons pushing from the air. If there are enough extra electrons on the metal, they can push some electrons off the point and into the air. The electrons land on the air molecules, making them negatively charged. The negatively charged air is repelled from the negatively charged metal, and a small wind of charged air blows away from the metal. This is called "corona discharge", because the dim light it gives off looks like a crown. The same thing happens in reverse if the metal has too few electrons (if it is positively charged). At the point, all of the positive charges in the metal pull all the electrons from the point, leaving it very highly charged. The air molecules that hit the metal point lose their electrons to the strong pull from the positive tip of the sharp point. The air molecules are now positive, and are repelled from the positive metal. There is one more trick the Van de Graaff generator uses. After we understand the third trick, we will put all of the tricks together to see how the generator works. We said earlier that all electrons have the same charge, and so they all try to get as far from one another as possible. 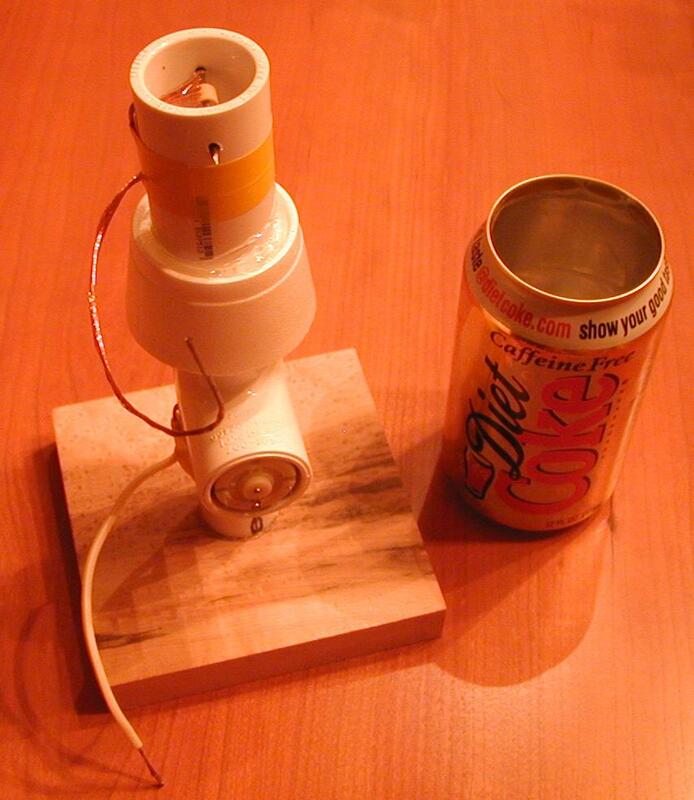 The third trick uses the soda can to take advantage of this feature of the electrons in an interesting way. 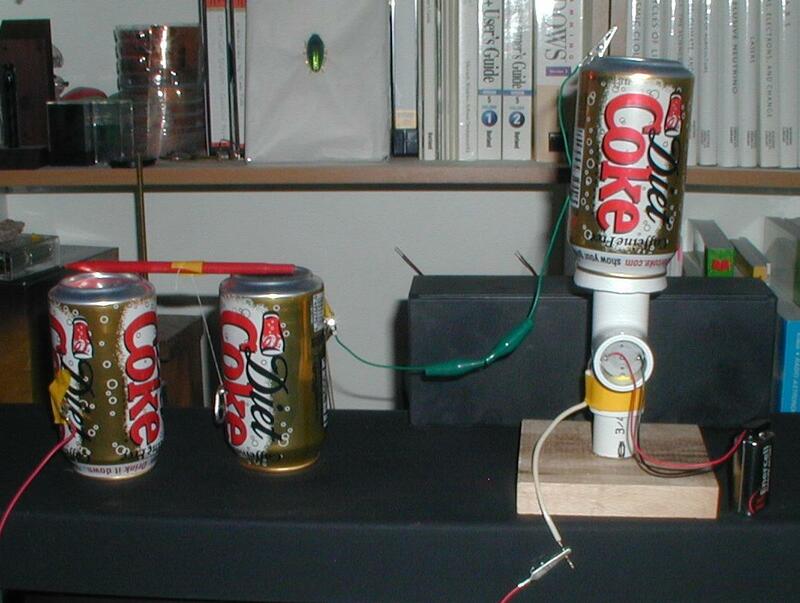 If we give the soda can a charge of electrons, they will all try to get as far away from one another as possible. This has the effect of making all the electrons crowd to the outside of the can. Any electron on the inside of the can will feel the push from all the other electrons, and will move. But the electrons on the outside feel the push from the can, but they do not feel any push from the air around the can, which is not charged. This means that we can put electrons on the inside of the can, and they will be pulled away to the outside. 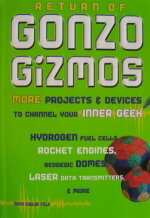 We can keep adding as many electrons as we like to the inside of the can, and they will always be pulled to the outside. So now let's look at the Van de Graaff generator with our three tricks in mind. The motor moves the rubber band around and around. 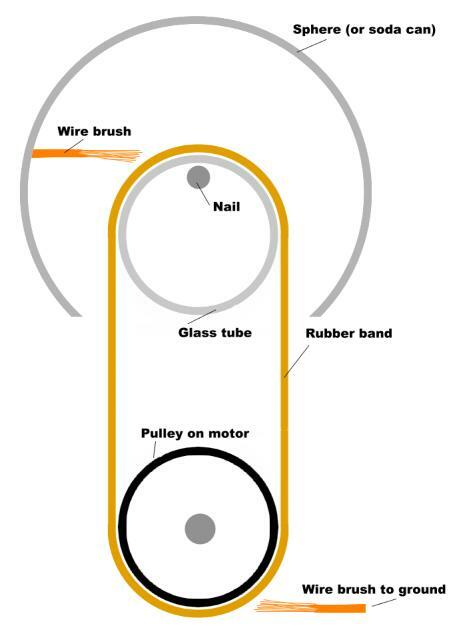 The rubber band loops over the glass tube and steals the electrons from the glass. The rubber band is much bigger than the glass tube. The electrons stolen from the glass are distributed across the whole rubber band. The glass, on the other hand, is small. The negative charges that are spead out over the rubber band are weak, compared to the positive charges that are all concentrated on the little glass tube. The strong positive charge on the glass attracts the electrons in the wire on the top brush. These electrons spray from the sharp points in the brush, and charge the air. The air is repelled from the wire, and attracted to the glass. But the charged air can't get to the glass, because the rubber band is in the way. The charged air molecules hit the rubber, and transfer the electrons to it. The rubber band travels down to the bottom brush. The electrons in the rubber push on the electrons in the wire of the bottom brush. The electrons are pushed out of the wire, and into whatever large object we have attached to the end of the wire, such as the earth, or a person. The sharp points of the bottom brush are now positive, and they pull the electrons off of any air molecules that touch them. These positively charged air molecules are repelled by the positively charged wire, and attracted to the electrons on the rubber band. When they hit the rubber, they get their electrons back, and the rubber and the air both lose their charge. The rubber band is now ready to go back up and steal more electrons from the glass tube. The top brush is connected to the inside of the soda can. It is positively charged, and so attracts electrons from the can. The positive charges in the can move away from one another (they are the same charge, so they repel, just like electrons). 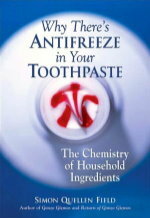 The positive charges collect on the outside of the can, leaving the neutral atoms of the can on the inside, where they are always ready to donate more electrons. 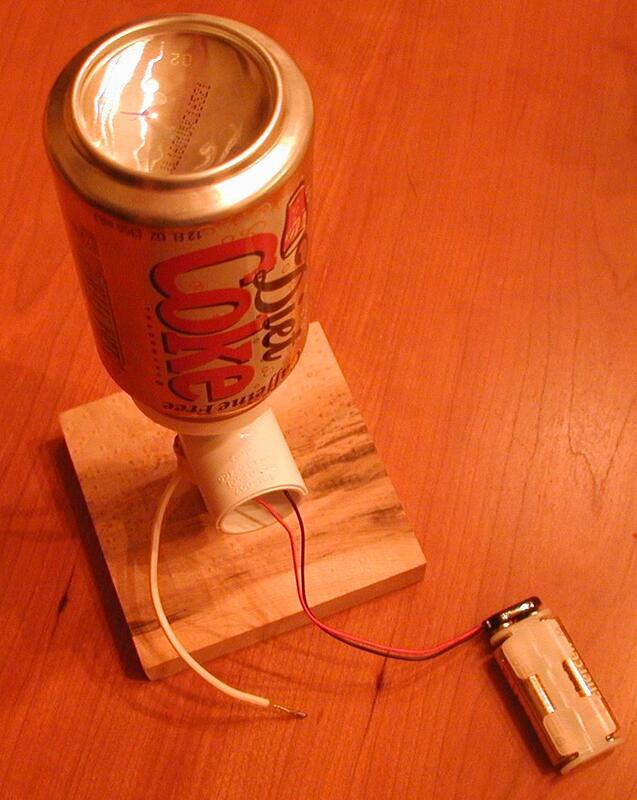 The effect is to transfer electrons from the soda can into the ground, using the rubber band like a conveyor belt. It doesn't take very long for the soda can to lose so many electrons that it becomes 12,000 volts more positive than the ground. When the can gets very positive, it eventually has enough charge to steal electrons from the air molecules that hit the can. This happens most at any sharp points on the can. If the can were a perfect sphere, it would be able to reach a higher voltage, since there would be no places where the charge was more concentrated than anywhere else. If the sphere were larger, an even higher voltage could be reached before it started stealing electrons from the air, because a larger sphere is not as "sharp" as a smaller one. The places on our soda can where the curves are the sharpest are where the charge accumulates the most, and where the electrons are stolen from the air. Air ionizes in an electric field of about 25,000 volts per inch. Ionized air conducts electricity like a wire does. You can see the ionized air conducting electricity, because it gets so hot it emits light. It is what we call a spark. 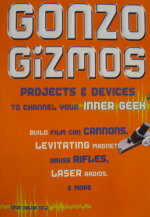 Since our generator can draw sparks that are about a half inch long, we know we are generating about 12,500 volts. If you aren't detecting any high voltage (no sparks, doesn't attract hair or paper) then you might try some of these suggestions. Try a different type of rubber band. Some are slightly conductive, which at 12,000 volts means conductive enough to leak all the current you have so carefully built up. Have a supply of many different types of rubber band to try. Make sure everything is very clean. Dirt and grease can be slightly conductive, and that will be enough to make the device fail. Make sure the top brush is touching the metal of the can. Some cans have a plastic coating inside. Scrape it off (or burn it off) to make a better connection. Make sure there are no sharp points extending outside the can. It is OK to have sharp points pointing inside the can, from the cut part of the top. Sharp points cause corona losses. Make sure the brushes are not touching the rubber band. This will put a coating of copper on the rubber, and make it conductive. Make sure you have a good ground connection. Make sure the motor is spinning fast.